Is the government preparing to dispose of our forests and other public land? Planning laws inhibit prosperity. That’s what we’re told by almost everyone. Those long and tortuous negotiations over what should be built where are a brake on progress. All the major parties and most of the media believe that we would be better off with less regulation, less discussion and more speed. Try telling that to the people of Spain and Ireland. Town planning in those countries amounts to shaking a giant dustbin over the land. Houses are littered randomly across landscapes of tremendous beauty, so disaggregated that they’re almost impossible to provide with public services. The result, of course, is a great advance in human welfare. Oh, wait a moment. No, it’s economic collapse followed by mass unemployment. Spain and Ireland removed the brakes on progress and the car rolled over a precipice. Their scarcely-regulated planning systems permitted the creation of property bubbles that trashed the economy along with the land. Needless to say, we have learnt nothing from this. Our lords and masters still whip the buttocks of the Gaderene swine. When the Infrastructure Bill was discussed in the House of Lords last week, our unelected legislators rained curses upon peace and quiet, beauty and stillness(1). Lord Adonis, a Labour peer, complained that “for the first time in 350 years, Britain will no longer have the world’s largest port or airport. That accolade will pass, symbolically, to Dubai.” The shame of it – to have some upstart petro-city making more noise and pollution than we do! For the government, Baroness Kramer boasted that “we are making the biggest investment in roads since the 1970s”. The Conservative peer Lord Jenkin, in discussing the new freedoms for frackers the government proposes, celebrated what he called a “drill, baby, drill Bill”. All this, we are assured, will enhance the life of the nation. 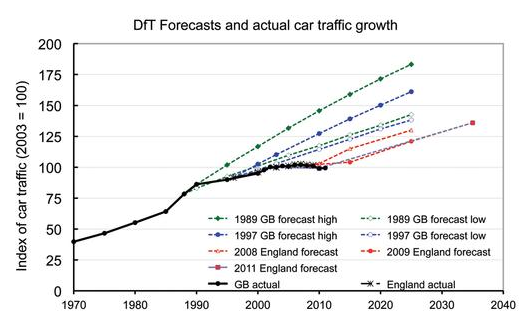 Since the 1980s, the Department for Transport has consistently forecast traffic growth along a steep trajectory(2). But the distance covered by car drivers in England is now 7% lower than it was in 1997(3). The total volume of traffic has flatlined since 2002, nixing every prediction the department has made(4). Last year, 32 transport professors wrote to the secretary of state pointing out that, in the absence of traffic growth, “the basis for major infrastructure spending decisions appears to be changing”(5). The only thing likely to induce more traffic growth, they argued, is building more trunk roads, and that would put intolerable pressure on the city streets into which they feed. The facts might have changed, but the policy remains the same. The department continues to make the same failed forecasts, using the same failed model. The desire to build – and to appease the construction industry and motoring lobby – comes first, and the forecasts are made to fit. So is the planning system. The government’s draft national policy statement for major roads weakens the protection of wildlife, ancient woodlands and treasured landscapes(6). It forbids any consideration of climate change during planning inquiries: motorways will officially produce no more carbon dioxide than cycle paths. Not a word of this was heard in the chamber last Wednesday. No one questioned the need for the road building programme of which the government boasted. The peers, an unlikely club of boy racers, stood only to demand that we should go further and faster, on a journey without purpose or destination. If they have their way, we will become the proud recipients of a new network of roads to nowhere. Like Benidorm’s Intempo towers, the tallest residential buildings in Europe, they will be commissioned in a convulsion of optimism and greed, before becoming monuments to bad debt and human folly(7). “Round the decay of that colossal wreck, boundless and bare …”. Is that what this is? I don’t know. During the Lords debate, Baroness Kramer insisted that this measure applies only to “surplus land” and “applies only to private rights and not to those that are public”(11). Just one problem: there are no such safeguards in the bill. The word “surplus” does not occur anywhere, and the bill creates specific powers “to extinguish public rights of way”(12). Yes, public – not private. Had Kramer read the bill she moved? Or was she making it up as she went along? In either case, until this is either clarified or struck out, the forests for which we fought so hard and, perhaps, all other state-owned land, could be at risk. But who needs all that, when you have the world’s biggest airport to boast of, and the biggest investment in pointless roads since the 1970s and a “drill, baby, drill Bill”? What else would anyone who loved this country wish for?